Raize iPod Video Converter is a professional iPod video software to convert your regular PC video files (avi, mpeg, divx, etc) into the proper video format that your iPod understands. It can convert AVI, MPEG, DivX, XviD, ASF, WMV, MOV, QuickTime, VOB, MOD, MP4 to iPod video, such as AVI to iPod, MPEG to iPod. In addition, The intuitive interface makes Raize iPod Video Converter the perfect tool for both new and experienced users. It gives advanced users the ability to finish the drag-drop to load or add video files, conversion with width*height, video size, bit rate, and frame rate adjusting. The output iPod movie/video supports iPod screen! Convert AVI, MPEG, WMV, MOV, MP4, DivX, ASF, VOB to iPod video. Converting in batches, convert multiple files at the same time. Support drag-drop to load video files. High converting speed, wonderful output quality for iPod. Raize iPod Video supports Intel Pentium D Dual-Core Processor and AMD Athlon? 64 X 2 Dual-Core Processor which ensures full use of your CPU. Easy to use, with the friendly and easy understandable interface. 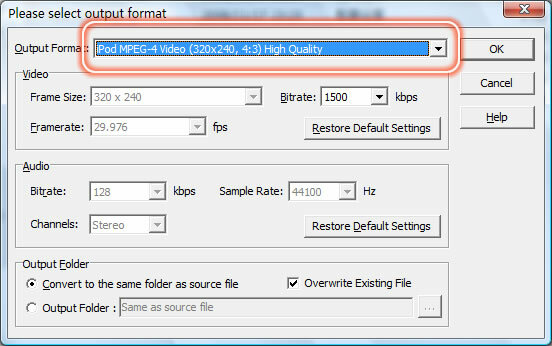 This utility allows you to convert MPEG to iPod video format, which can be supported by Apple iPod. Convert your favorite AVI to iPod format that fixed for iPod's screen. Convert your divx video to iPod mp4 video format. It is a professional XviD to iPod converter as well. It allows you to convert XviD to iPod easily and quickly. As a powerful iPod converter, Raize iPod Video Converter also supports WMV format, and lets you convert your WMV to iPod video format. Now you can enjoy your WMV video on Apple iPod whenever you like. Some digital cameras capture video as mov format, if you would like to enjoy those video on your iPod, just use Raize iPod Video Converter, which converts your mov to iPod directly.